It was a bit of work but it was a pretty good cake. I'm working on my own version of this delightful cake. It will be coming soon. 1. Preheat the oven to 350F and generously butter the bottom and sides of one 10-inch springform pan. Line the bottom of the pan with parchment. Wrap the outside of the pan with aluminum foil. Make sure the foil covers the bottom and extends all the way up the sides. 2. To make the cheesecake layer, put one package of the cream cheese, 1/3 cup of the sugar, and the cornstarch in a large bowl and beat with an electric mixer on low until creamy, about 3 minutes, scraping down the bowl a couple of times. Blend in the remaining cream cheese, one package at a time, scraping down the bowl after each. Increase the mixer speed to medium and beat in the remaining 1 cup sugar, then the vanilla. Blend in the eggs, one at a time, beating well after adding each. Beat in the cream just until it's completely blended. Don't overmix it. 3. Gently spoon the batter into the pan and place it in a large shallow pan containing hot water that comes about 1 inch up the sides of the springform. Bake the cake until the edges are light golden brown and the top is slightly golden tan, about 1 hour. Check it after 45 minutes. Remove the cake from the water bath, transfer to a wire rack, and cool in the pan for 2 hours, cover with plastic wrap, and refrigerate until it's completely cold, about 4 hours. Place in the freezer until ready to assemble the cake. 4. Meanwhile, prepare the devil's food cake layers. Check that the oven is preheated to 350F. Generously butter the bottom and sides of three 10-inch round layer cake pans. Line the bottoms of the pan with parchment paper. 5. Sift the flour, baking powder, and salt together in a small bowl. Cream the butter and both sugars together in a large bowl with the mixer on medium until light yellow and creamy. Add the egg yolks, one at a time, beating well after each. Beat in the melted chocolate and vanilla. Using a wooden spoon, stir in the flour mixture, alternately with the milk, mixing well after each until blended. 6. Put the egg whites and cream of tartar in a clean medium-size bowl and beat with clean, dry beaters on high until stiff peaks form. Fold about one-third of the whites into the chocolate batter until they disappear, then gently fold in the remaining whites. Don't worry if you still see a few white specks--they'll disappear during baking. Divide the batter evenly between the three pans. Bake until a toothpick inserted in the centers comes out with moist crumbs clinging to it, about 25 minutes. Check it after 20 minutes. Cool the cakes in the pans on a rack for 15 minutes, then remove the cakes from the pans and gently peel off the paper liners. Let cool completely, about 2 hours, then cover with plastic wrap and refrigerate overnight or until ready to assemble the cake. 7. Make the frosting. In a large bowl, sift the confectioners' sugar, cocoa, and salt together. In another large bowl, cream the butter with a mixer on high until light yellow and slightly thickened, about 3 minutes. With the mixer still running, beat in the chocolate, corn syrup, and maple syrup. Reduce the mixer speed to low and beat in the sugar-cocoa mixture in two additions, beating well after each. Blend in the cream until the frosting is a spreading consistency, adding a little more cream if needed. Whip the frosting on high until light and creamy, about 2 minutes more. 8. To assemble the cake, remove the cheesecake from the freezer and let stand at room temperature about 10 minutes. Place one layer of devil's food cake, top side down, on a cake plate and spread with some of the frosting. Srpead 1/3 of Dulce de leche on top of the icing. Release and remove the ring of the springform, then remove the frozen cheesecake from the bottom of the pan. Place top side down on the frosted cake layer and spread with some frosting and another 1/3 of the Dulce de leche. Top with the second devil's food layer, top side down. Spread with more frosting and remaining Dulce de leche. Cover with the third devil's food layer, top side up. Brush away any crumbs from the sides and top of the fudge cake layers. 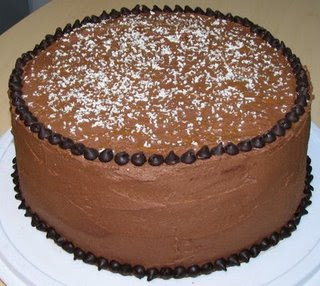 Frost the sides and top of the cake with the remaining frosting, spreading the top with frosting about 1/2 inch deep. Use a long metal spatula that has been warmed under hot running water to smooth out the frosting on the sides and top of the cake. 9. Grate some white chocolate on top of the cake. Drizzle whatever Dulce de leche spread you have left on the top of the cake as well. 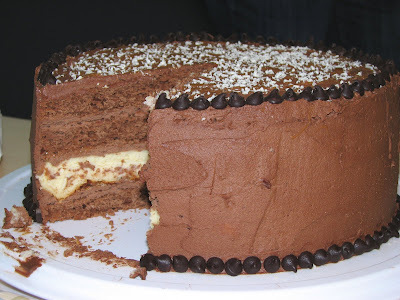 Line the bottom of the cake with a circle of chocolate chips. Do the same at the top. 10. Refrigerate the cake for at least 2 hours to allow the cheesecake to thaw enough to easily slice. Let the cake come to room temperature before cutting into it. Use a sharp straight-edge knife, not a serrated one, to cut it.